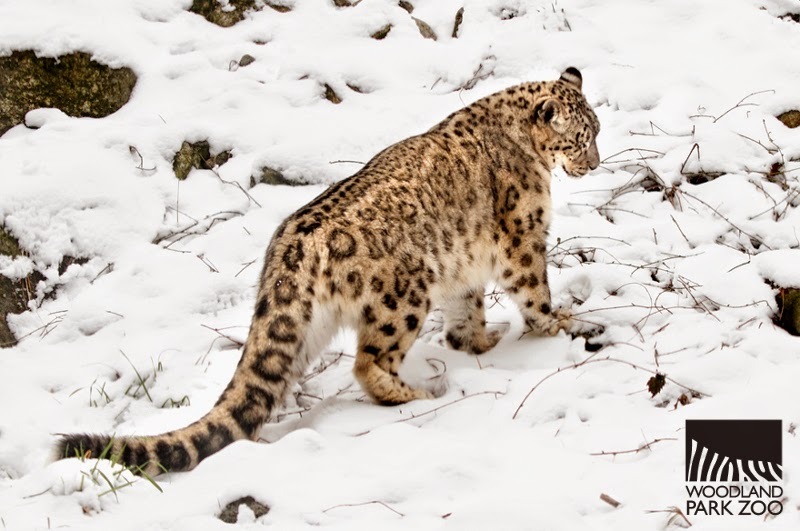 A young family walks the length of the snow leopard exhibit, failing to notice the sly cat prowling in the shadows, just a step behind their line of sight. They are about to walk away from the exhibit when the daughter, maybe 6 years old, turns around and finally spots the snow leopard, coiled up tight like a spring. There is just enough time for her to utter “She looks sleepy,” before the feline pounces toward the fence. Safe on the other side of the barrier, the little girl lets out a wild giggle, a sound mixed with surprise, thrill and then a little embarrassment once she realizes she’s clutching her mom. A young Asha and Shanti on the chase. Photo by Dennis Dow/Woodland Park Zoo. That girl just learned what zoo staff learned long ago—never underestimate Asha and Shanti. 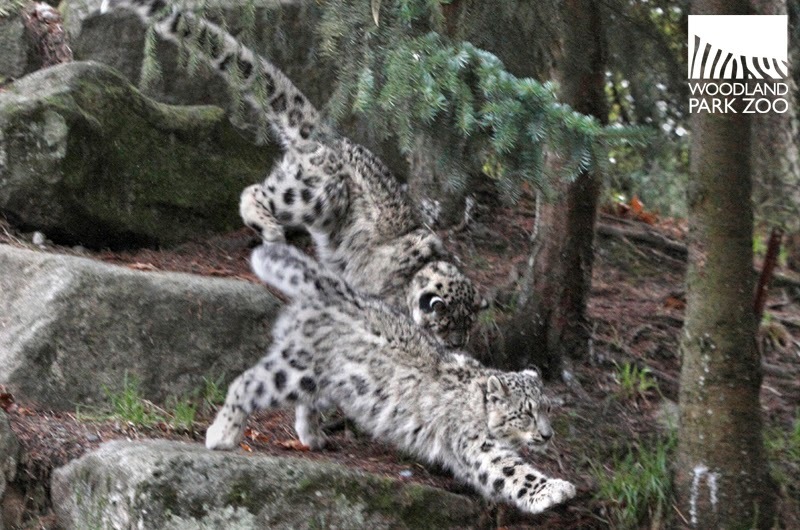 Though both snow leopard sisters are blind in one eye, they have developed into playful huntresses. We have watched them overcome their obstacles, and soon, we will watch them become fully independent and move out on their own. February’s snow was an enriching treat this winter. Photo by Dennis Dow/Woodland Park Zoo. The snow leopard sisters have just wrapped up their pre-shipment veterinary exams, and the countdown to their spring departure begins. Though we do not yet have an official last day, we’re heading into the final weeks for the girls at Woodland Park Zoo before they move on to their new home at Big Bear Alpine Zoo in California. You’ll want to plan a visit soon to say farewell to the tenacious twosome who survived a rocky start and have gone on to amaze and inspire us all. Asha and Shanti at 3 months old. Photo by Ryan Hawk/Woodland Park Zoo. Born May 2, 2012, Asha and Shanti were celebrated with an outpouring of joy from the community—the announcement of their birth remains our most read blog post of all time. It only took a few weeks, however, for the challenges to emerge, first with the loss of their brother and littermate, and then with a diagnosis of a relatively rare congenital eye anomaly. The girls both exhibited multiple ocular coloboma in which the eye stops growing before it is fully developed. This left the girls each with functional vision only in their left eye, and ultimately each had their right eye removed to prevent infection and future complications. But has that stopped them from growing up into active, spirited leopards? Not a chance! 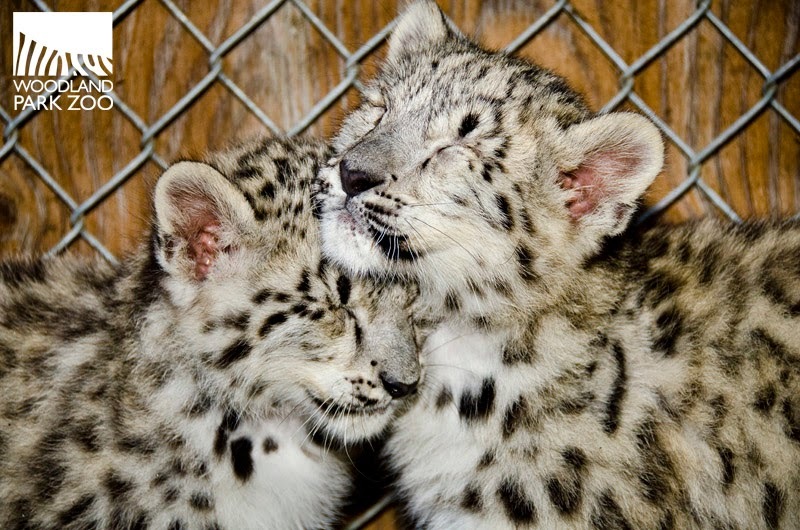 Thanks to the extraordinary care provided by the zoo’s keeper and veterinary staff, volunteer veterinary ophthalmologist Dr. Tom Sullivan with the Animal Eye Clinic Seattle, and, of course, experienced snow leopard momma, Helen, Asha and Shanti have thrived here at Woodland Park Zoo. As the girls are maturing and have grown independent of their mother, it is now time to find them a new home. Working with the Species Survival Plan (SSP), a collaborative effort to manage species populations across conservation zoos, we found a new home that will fit Asha and Shanti’s unique needs. At Big Bear Alpine Zoo, which is known for its wildlife rehabilitation program, Asha and Shanti will be able to remain together and continue to receive specialized medical care. The cubs’ father, Tom, will also move this spring. Photo by Ryan Hawk/Woodland Park Zoo. 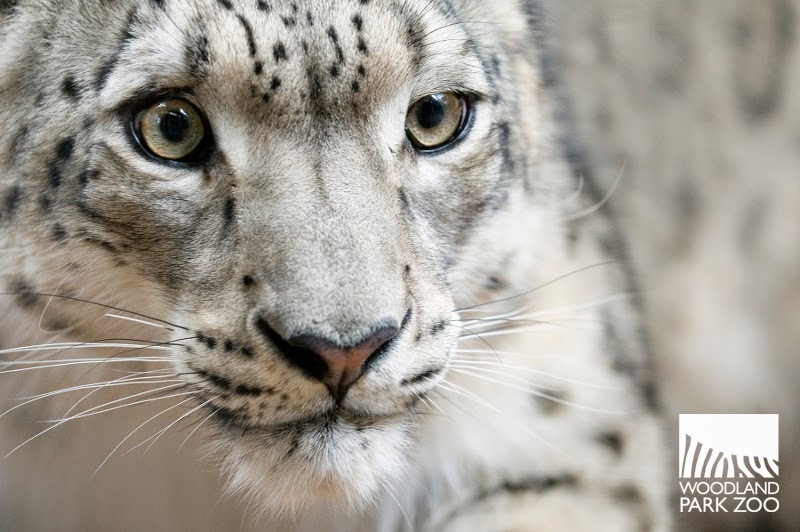 More changes are in store, as the girls’ father, Tom, will be heading to Oklahoma City Zoo in the coming weeks, another move recommended by the SSP to keep the genetic diversity of the snow leopard population always moving and mixing. Remaining here will be Helen, the cubs’ mother, who will receive a new mate through the SSP with the hope that they will breed in the near future. Helen has raised two sets of babies already and has proven capable of nurturing cubs through even the toughest obstacles. Helen will remain at Woodland Park Zoo and will be matched with a new mate through the Species Survival Plan. Photo by Tiana Klineburger/Woodland Park Zoo. 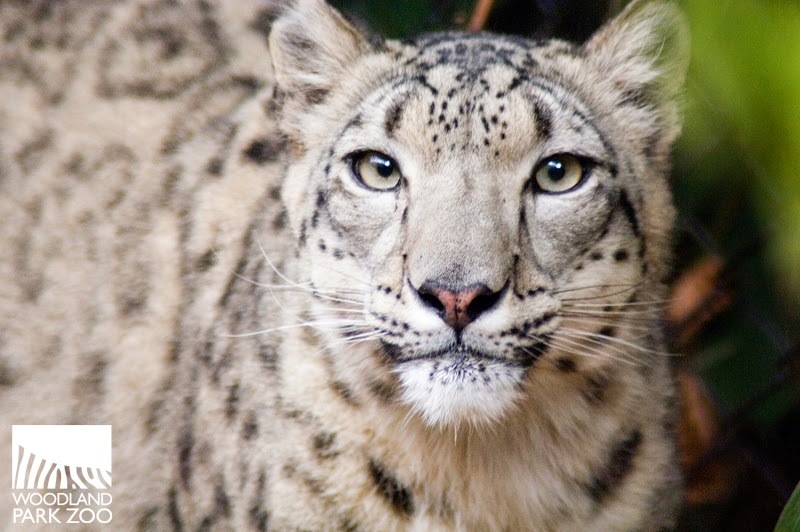 Endangered and elusive in the wild, snow leopards are hard to track and harder to study. Working with the Snow Leopard Trust, a Woodland Park Zoo Partner for Wildlife, we have seen breakthroughs in research methodologies in the snow leopards’ native Central Asia, where techniques like motion-sensor cameras and radio collars are shedding new light on the range, behavior and health of snow leopard populations. As we learn more about the health of these animals thanks to research and care in zoo settings, we can apply these two tracks of knowledge to better understand, and ultimately, better protect these disappearing predators. Is the eye condition hereditary? Will the girls be used for breading? Scientists do not know yet if coloboma is tied to genetics or if it is something that is caused by environmental factors. We have provided DNA samples from Asha and Shanti to researchers studying this issue in hopes that we can advance knowledge about this rare condition that impacts other species as well. Asha and Shanti will not participate in the breeding program, and will stay with each other rather than with mates. I've enjoyed meet and knowing both sets of Helens and Toms offspring and will miss Asha and Shanti just as much as I miss Gobi and Batu!!! Tom leaving is hard too but happy Helen is young enough to have a new mate and maybe give the World more Beautiful babies! !